Jayden Croft scored two rushing touchdowns in the fourth quarter (including the fantastic effort seen above) to cut the Tumwater deficit to just seven points with 4:26 to go. 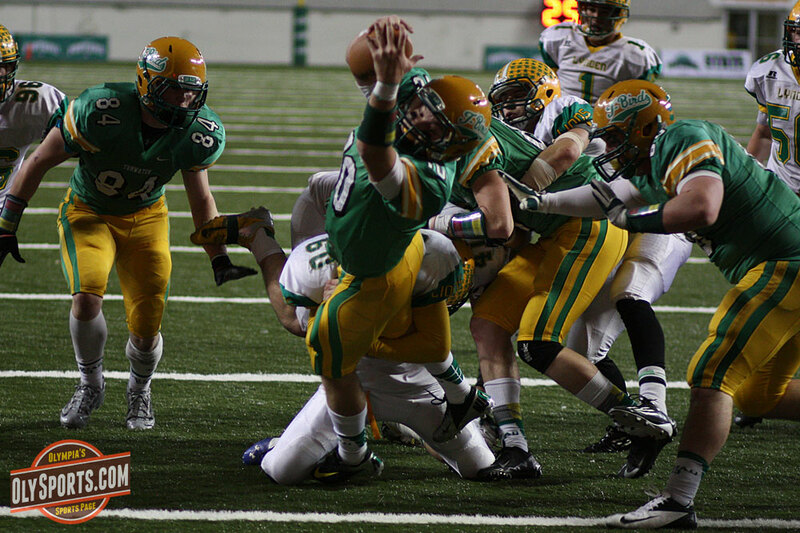 But Lynden wrestled an onside kick attempt away from a pile of T-Birds on the ensuing kick off and finished off the drive with a 30 yard field goal with 1:34 left to play and held on to a 38-28 win in the WIAA 2A state title game at the Tacoma Dome on Saturday afternoon. Looking to avenge their 41-7 loss to these very same Lions in the state title game last season, Tumwater got off on the wrong foot on the opening drive of the game. Jarred Moffat scooped up a fumble by Tumwater quarterback Jayden Croft and rumbled 44 yards to put Lynden on top 7-0 just a minute and a half into the ballgame. Minutes later, on the third play of their first offensive drive, Lions’ quarterback Sterling Sommers found Scooter Hastings and Hastings took it 48 yards to the house to extend the Lynden lead to 14-0 with 5:14 left in the first quarter. Just like their last meeting one year ago, the T-Birds found themselves down by double digits early. But the T-Birds would answer on their next possession when Trevor Davis busted a third down run to the outside and tiptoed the sidelines to inbounds and finished off a 47 yards touchdown that cut the Lions lead in half, 14-7. Lynden would answer right back when Sommers hooked up with Jalani Phelps on a 12 yard first down completion and another 21 yard completion on the next play before Sommers punched it in from a yard out to give the Lions a 21-7 lead early in the second quarter. Again, the T-Birds answered on Easton Trakel’s 42 yard touchdown run. The extra point from Elijah Hill was no good but Lyden’s lead was trimmed to 21-13 with 8:55 left in the first half. The defense finally picked up for both teams until late in the first half. After a three and out by the T-Birds, Lynden started a drive on their own 46 yard line with 1:12 left in the second quarter. Jaremy Martin, who took over for injured starting running back Trent Postma after Postma was injured on their previous drive, broke a 20 yard run on the first play and then two plays later, broke another 20 yard run, this time into the end zone with 25 second left and Lynden took at 28-13 lead into the locker room. Martin scored again, this time from eight yards out midway into the third quarter. Down 35-13, things looked bleak for Tumwater, but this year, the T-Birds would not go without a fight. On the next possession, they converted two third downs and went 66 yards over the next five minutes before Croft scored from a yard out with seven second gone in the fourth quarter. Christian Cummings scored on the two-point conversion to get them within 14 points, 35-21. Lynden quickly pushed the ball into Tumwater territory on the next possession and looked to be on their way to once again respond to any T-Birds threat. But on a second down and seven on the Tumwater 45, Korye Trejo pounced on a Cameron Wainright fumble and the T-Birds took over in excellent field position at the 8:28 mark of the fourth quarter. Cummings took over on the next possession, rushing four times for 35 yards including an eight yard run on first down that got the T-Birds to the five yard line. Trevor Davis was stopped on second down for no gain and Cummings rushed for one yard on third down to set up fourth down and one. On fourth down, Croft took the snap, rushed straight up the middle, fought through Lynden defensive lineman Tristan Campbell and dove into the end zone for the touchdown bringing the T-Birds to within a touchdown of the Lions with just 4:26 left to play. But somehow, after Addison Barrett and a number of other T-Birds seemed to have corralled the loose ball on the onside kick, Lynden’s Rudy Mendoza came out of the pack with the football and Lynden would drive down to the 22 yard line before Alex Otano-Guenth’s 30 field goal sealed the deal and gave the Lions a 38-28 win and their second straight 2A state championship. The T-Birds rushed for 263 yards including 84 yards from Cummings and 37 yards and two touchdowns from Croft. But they couldn’t stop Lyden’s Sommers, who passed for 263 yards and a touchdown and rushed for 44 yards and a TD. Lynden capped off a perfect season, going 14-0 for the second straight year, while Tumwater snapped a 13 game winning streak and finished 13-1. Posted on December 8, 2013, in Football, High school, Photo Galleries, Tumwater HS. Bookmark the permalink. Leave a comment.